After a swim at Coryton Cove at Dawlish I was wandering along the shore when I came upon a small creature on the sand which stopped me in my tracks. It looked quite outlandish, with bizarre green iridescent 'fur' on one side. I thought perhaps it was a sea slug, but a friend tells me it is a sea mouse. I never even realised there was such a thing as a sea mouse. 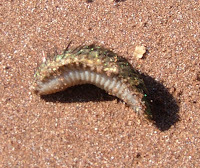 It is a sort of worm, and is apparently an 'unusual species which is rarely seen'. I believe it is quite local to the South Devon and Dorset coast. 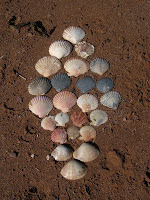 The shells on the beach were stunning. Scallops in all colours from black to pink, as well as slipper limpets, winkles, whelks and cockles. 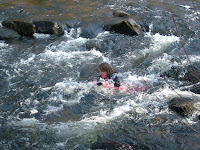 It's the perfect solution for those days when the river is just TOO icy; get on your boogy board, thus avoiding total immersion (though undignified head soakings are all part of the experience). It was a beautiful day, and we wanted to be in the water, but the Dart is still very cold at the moment. So, rather than swimming, we decided to surf the rapids. It's official - the tombstoning season has started. Today at Spitchwick the lads were leaping, and giving it their best. Well, the sun was shining - it would be rude not to. It's the same rule that says that once there's even the hintiest smidge of summery weather you've got to get the barbie out, along with the baggy shorts and the lager. Here are the brave souls in all their glory. 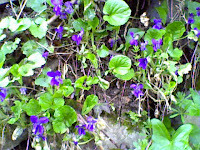 While out today we came across the most beautiful bank of violets. They made my heart lift. The primroses are also out, as are daffodils and crocuses. The cherry tree in our garden is a pink cloud of blossom , with bees buzzing among the branches. 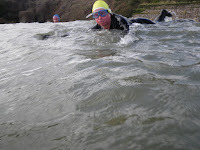 It was our intention to swim up the Erme estuary at Mothecombe, but a few waves got in the way. This was not actually a problem, in fact it was rather good fun, as this picture of me shows, though I admit I do not look particularly happy. I am trying not to be obliterated; you can see me demonstrating my famous 'belly flop the wave' technique for avoiding total wipeout. 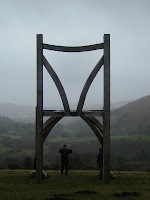 Whenever I visit the Giant's Chair in the middle of the Moor the weather seems to turn ugly. The first time I went to find it there was thick fog and we nearly missed it altogether - despite its size. Today was no exception. It was like that very scary black and white TV programme, the Singing Ringing Tree, that I watched as a child. Every time the evil dwarf arrived he would be heralded by terrible storms, rain and thunder....which is what seemed to happen as we approached the Chair. Despite this it definitely feels like a force for good. "Sunbeams scorching all the day" is a line from one of the best known Lent hymns. Although conditions today were hardly desert-like, the sun shone unreservedly all afternoon. We walked from Thurlestone to Hope Cove and back, and everything was filled with light and colour and intensity. The sea was a dazzling blue, and the fields an electric green. Hope Cove is just so charming it's not true. 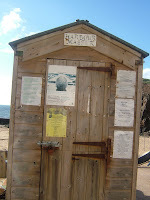 It has a tiny harbour wall, a tiny harbour master's office (pictured), and tiny thatched cottages.